Originally published by the New Zealand Herald. A faulty pipe from an offshore oil field run by Royal Dutch Shell PLC near Nigeria’s coast spewed crude oil into the ocean for as much as 25 hours as workers loaded a waiting tanker, the company acknowledged Friday. While Shell continues to investigate the cause of what likely is the worst offshore spill in more than a decade near oil-rich Nigeria, the nation’s beleaguered government remains largely reliant on the oil firm to clean up the spill. While the huge slick remains offshore, it still poses a danger to wildlife and plants in a region where spills already stain the environment. 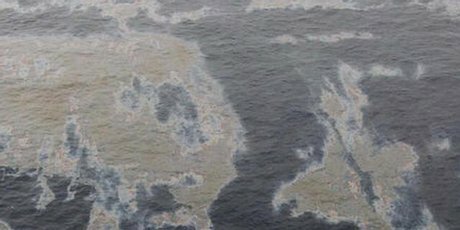 The spill occurred at the Bonga offshore oil field, about 120 kilometres off Nigeria’s coast. The field, which Shell operates in partnership with Italy’s Eni SpA, Exxon Mobil Corp., France’s Total SA and the state-run Nigerian National Petroleum Corp., is controlled from a large ship as opposed to a stationary rig. Information released by Shell shows workers discovered the spill Tuesday as they tried to fill a waiting tanker with crude oil. Loading tankers takes roughly 25 hours, meaning the spill could have begun at any time during the process. A London-based spokesman for Shell declined to comment on specifics about the spill, saying a company is still investigating the cause. The company did release an underwater image of the 48-centimetre pipeline that caused the leak, which showed a rupture along it. Shell said the leak on the pipe has been plugged and that less than 40,000 barrels (1.68 million gallons) of oil has spilled into the Atlantic Ocean. That likely represents the biggest offshore spill near Nigeria since 1998, when roughly the same amount of oil poured out of a Mobil offshore field, sending oil slicks as far as the country’s commercial capital of Lagos. The Bonga field produces about 200,000 barrels of oil a day and represents about 10 per cent of production in Africa’s most populous nation. Shell has said it shut down the field and has offered no estimate of when production could resume at a field vital to Nigeria’s government finances.